Aqualite Outdoor LCD and LED TV screens are resistant to sea water, salt, rain, snow, humidity, moisture and heat along with almost any other possible weather condition. Aqualite Outdoor work with marine architects, super yacht interior designers, luxury boat builders, marine electricians and in fact anyone who needs to be involved to ensure that you get the very best on board AV, advertising display or digital signage system possible. Our fully waterproofed, all weather screens are designed with automated and remote controlled lift/slide/tilt mechanisms very much in mind and if required we can remove the hassle and handle this as part of your installation enquiry. 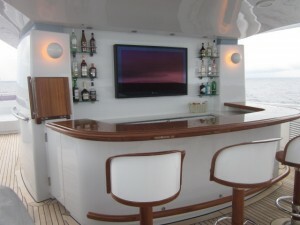 Aqualite Outdoor TV screens are compatible with all on board TV, Hi-Fi, Wi-Fi, audio/visual, lighting control, automation and CCTV security systems installed in all marine locations and are perfect for queue management or digital signage installation in all outdoor maritime, naval, off shore and on board locations. 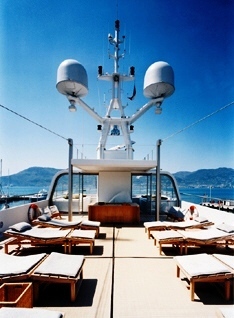 Super yacht interior designers and luxury boat building companies such as Van Berge Henegouwen, Sunseeker, Princess, Azimut-Benetti Group, Bilgin Yachts, Icon Connect and Sitep Yachting continue to specify and install Aqualite Outdoor TVs as part of their on board luxury AV entertainment and home cinema system installations. Please click on the links below for more information on Aqualite’s range of salt, sea and waterproof digital signage panels, electronic noticeboards and LED or LCD display screens for motor boats, sailing yachts, passenger cruise ships, cargo and container ships, luxury cruise liners, ferries, marinas, harbours and ports. Please contact us if you are interested in discussing on board entertainment systems, marine communications, super yacht security or IT systems for the luxury yacht or marine market. We’d be delighted to help.